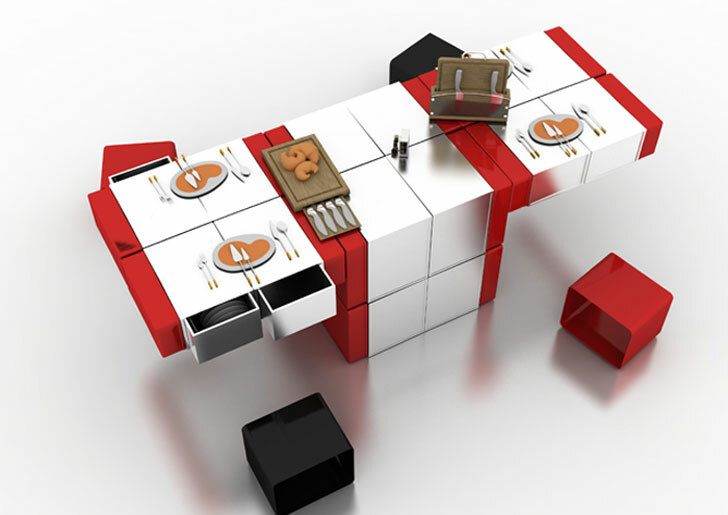 HAN'S Designs' Transforming Furniture Module Goes from Shelf to Bed to Dining Table! HAN’S Designs’ Transforming Furniture Module Goes from Shelf to Bed to Dining Table! Living in the city often means trading down for a small space, but you can still keep things spacious and streamlined with HAN’S Designs‘ multi-faceted, transforming furniture unit. This cool module can go from shelf to desk to dining table to even a bed with little effort! The module comes in a classic red and white, and cushion-topped cubes mean you don’t have to sacrifice comfort for compactness. The design is just a concept right now, but you can see a model simulation on their site here. Living in the city often means trading down for a small space, but you can still keep things spacious and streamlined with HAN'S Designs' multi-faceted, transforming furniture unit. This cool module can go from shelf to desk to dining table to even a bed with little effort! The module comes in a classic red and white, and cushion-topped cubes mean you don't have to sacrifice comfort for compactness. The design is just a concept right now, but you can see a model simulation on their site here.